Over 2.6 million people worldwide are affected by Pulmonary Hypertension and Multiple Sclerosis, either directly or through a loved one. By donating, you can helpe the world move towards a better and brighter future. Questions? Comments? Send us an email at dewittracephms@gmail.com or call us at 517-281-6197 or 517-420-3430. Mackenzie Grubich brightened the lives of her family and friends with her constant, contagious, and incredible smile and big hugs. She had a way of warming the hearts of all ages. She was a fun friend and yet a quiet companion who lived with enthusiasm. She loved life and made the most out of it. She was most often found riding her Dora 4 Wheeler throughout the neighborhood waving and saying "Hi" to everyone. Mackenzie was born in August of 2004 with both of her lungs partially collapsed. She landed in the PICU often, was on a restricted diet, and within the span of 4 years, visited 12 sepcialists searching for a diagnosis. Mackenzie endured blue episodes, had a high red cell blood count, and was in the lower 3rd of the charts. Throughout her countless doctor appointments, blood draws, etc., Mackenzie's enthusiastic spirit did not falter. Finally, at the age of 4, Mackenzie was diagnosed with Pulmonary Hypertension secondary to Patent Ductus Arteriosus (PDA). PDA is a condition in which the ductus arteriosus does not close. (The word "patent" means open.) The ductus arteriosus is a blood vessel that allows blood to go around the baby's lungs before birth. Soon after the infat is born and the lungs fill with air, the ductus arteriosus is no longer needed. However, Mackenzie’s hadn’t closed and with mistreatment for four years was too large to close and causing high blood pressure in the lungs (pulmonary hypertension). Despite rapid progress in treatment for pulmonary hypertension, repeated misdiagnosis causes many patients to receive care only at advanced stages of the illness. Mackenzie was placed on sildenafil (Revatio) better known as Viagra a vasodilator. There are currently 9 FDA approved therapies for Pulmonary Hypertension, however, none of those therapies have been approved for pediatrics by the FDA. 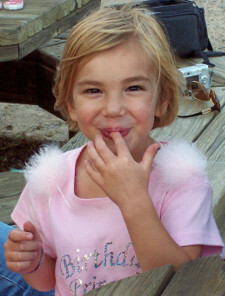 At the age of 5 Mackenzie developed pneumonia while vacationing in Florida. She was placed on a respirator and flown back to Michigan. After a 6 week battle with chronic pulmonary hypertension and pneumonia, Mackenzie became one of God's angels. Mackenzie is love, she is happiness, she is determination. She was little in size but most importantly big at heart. She drew us all in with her smile, her hugs and her waves and most importantly she taught us to ignore limitations that life may have and instead approach each day with enthusiasm. Steve Rummel, Co-Race Director, was diagnosed with Multiple Sclerosis (MS) late in 2007. MS is a chronic, often disabling disease that attacks the central nervous system (CNS), which is made up of the brain, spinal cord, and optic nerves. Symptoms may be mild, such as numbness in the limbs, or severe, such as paralysis or loss of vision. The body's immune system attacks the nerves and causes a "short circuit" that disrupts messages from the brain to other parts of the body. The progress, severity, and specific symptoms of MS are unpredictable and vary from one person to another. One day, Steve woke up with most of the vision gone in his left eye. He was referred to experts at the MSU Department of Neurology, and has been involved in a clinical study there to advance research into helpful drug treatments. Up until recently, the only FDA approved medications were disease-modifying injections. However, the last few years have seen the introduction of new oral medications. Unfortunately, there is still no cure for MS. The National Multiple Sclerosis Society will use funds collected from this event to not only support research for a cure tomorrow, but also to provide programs which address the needs of people living with MS today. Over 93% of all contributions are used directly for research, programs and assistance.